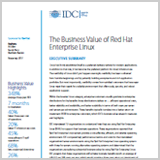 IDC interviewed 12 organizations to understand how they are using Red Hat Enterprise Linux (RHEL) to support their business operations. These organizations reported that Red Hat Enterprise Linux servers provide a cost-effective, efficient, and reliable operating environment. IDC compared key performance metrics and costs for the interviewed organizations’ server environments using the Red Hat Enterprise Linux operating system with those for servers running alternative operating systems and determined that the organizations are realizing substantial business value by using Red Hat Enterprise Linux. A YouTube video showing the Red Hat Ansible Tower.